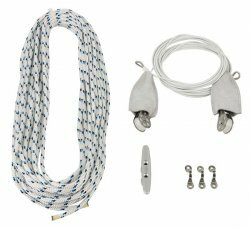 Lazy Jacks : Schaefer Marine, Inc.
Lazy Jack kits by Schaefer tame today's full batten mainsails and work well with conventional sails. Our design allows for the use of an existing sailcover without the need for extensive modifications. 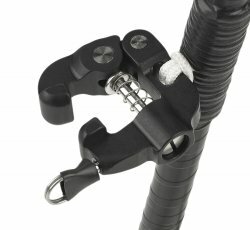 The use of thimble eye straps attached to the bottom of your boom keep the hardware away from the cover and enable you to tuck your sailcover under the lazy jack control lines. 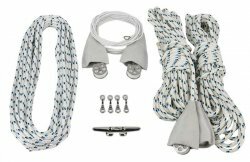 Each kit includes eye straps, open base cleats, lashing eye blocks with elkhide chafe guards, vinyl coated wire and Dacron yacht braid with eye splices. 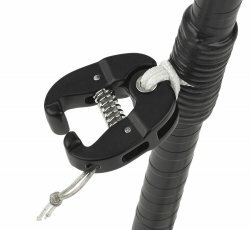 Since 1966, Schaefer Marine has stood at the forefront of Marine hardware design and construction, offering rugged, durable gear engineered to perform no matter how demanding the conditions.